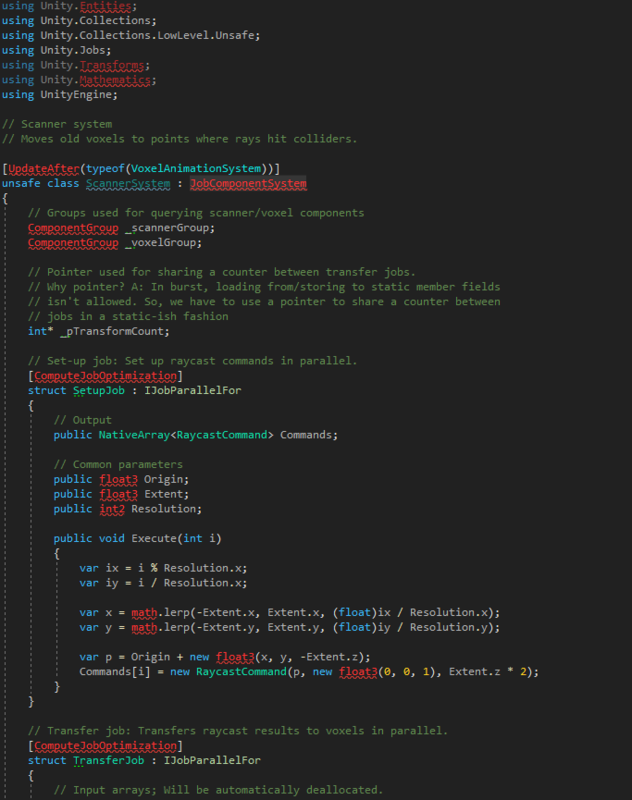 Welcome to the Entity Component System and C# Job System sub forum. Here you can find the resources required to start building with these new systems today. We have been working on a new high performance multithreaded system, that will make it possible for games to fully utilise the multicore processors available today without heavy programming headache. This is possible thanks to the new Entity Component System which provides a way to write performant code by default. Paired with the C# Job System and a new math-aware backend compiler technology named Burst. Unity can produce highly optimised code for the particular capabilities of the platform you’re compiling for. These new systems work with Unity 2018.1 and newer versions. The new C# Job System takes advantage of multiple cores in a safe and easy way. Easy, as it’s designed to open this approach up to user scripts and allows users to write safe, fast, jobified code while providing protection from some of the pitfalls of multi-threading such as race conditions. The C# Job System ships in 2018.1. Burst is a new LLVM based math-aware backend Compiler Technology makes things easier for you. It takes the C# jobs and produces highly-optimized code taking advantage of the particular capabilities of the platform you’re compiling for. dsx75, AntonioModer, MUGIK and 13 others like this. Thank you for compiling all this into a new Sub Forum and providing all the initial info. It would be great if you could provide a simple instruction on how to start on an empty project. Let's start playing with it...exciting. Is there an API documentation yet? some things like Unity.Burst / Unity.Jobs seem to be already in the Scripting API documentation --- is there something for Unity.Entities yet? MartinGram, RootCauseProductions and SubPixelPerfect like this. Will this be compatible only with the preview build or can we use the regular beta versions? @sngdan Thanks for the feedback. I will provide better "Getting started" instructions once GDC winds down a little bit. @Enrico-Monese In time you will not need to use the preview build. Some changes sadly didn't make it into 2018.1b12, but we hope that they will land soon. Another step is that you have to enable jobs, by adding ENABLE_MANAGED_JOBS to the scripting define symbols in the player settings, or else this doesn't compile. C:/ProgramData/Unity/cache/packages/staging-packages.unity.com/com.unity.entities@0.0.11/Unity.Entities.Properties/TypeInformation.cs(150,13): warning CS0162: Unreachable code detected. Burst ships as an experimental package in 2018.1, and we’ll continue to develop and release new versions of the package in the 2018.x cycle. For the current package release, Burst only works in the Unity editor. Is there estimate when we'll get Burst that runs on standalone builds so we can properly benchmark it? Like, is that still planned for 2018.x? Zoey_O and rizu like this. How can I use ESC at all and where to find Package or repo or something to make it work? Tried to search or read forums for simple reference where it take from. Did you follow post#2 in this thread? Because you must have packages in manifest. Huh, I spent a good portion of last year inestigating this kind of functionality, and here it comes, waltzing into Unity. I will have to look into this when I get home. Cool! It's working! Thank you! Because you must set manifest, set .NET 4 and reimport all for assets after all reload project and profit. No LWRP in this version? How can i get ECS with the SRP LW stuff? There you should be able to download the SRP packages. For those who are getting this error, you've to install the 2018.1.12b from the link, and not from Unity Hub. Apparently they're different builds with the same version number. Will the new released 2018.1.b13 version work? Maybe they should note on the version that doesn't have ECS "Does not include the ECS package". I've downloaded b12 and b13 to test out the new code to no avail, and now I'm downloaded b12 that's apparently not the same b12!? Maybe could just be noted for everyone before they download. 1. Download the Unity beta version from here. Important Note: Only this special beta version from the link provided will work with the new entity component system preview. Other beta versions downloaded from the default beta page will not work at this time. 4. Delete the contents of the Library folder in the root of your project located under [project folder] > Library. 5. Reopen the project in Unity and then open the Package Manager located under Window > Package Manager and insure that the Entities package is displayed. 6. All done. You should now have full access to all Unity ECS functions. mgmhunt, Aldo-V, zhuchun and 8 others like this. Thank you. It was the manifest.json which needed amending. I did see in a picture above but couldn't be bothered to type it all out, thanks for sharing cut and paste Isaiah Kelly! Thanks @IsaiahKelly, I waste my all sunday trying to enable ECS, I downloaded 3 different beta versions from Unity beta program page and tried to install and test over and over again but nothing worked and I was getting so many errors by default. Finally I read your instructions and it worked. The problem is the beta release version. As you say, only the linked beta release works, rest of them does not. When do you plan to add the ecs to the official beta cycle? fiyorin and tbriley like this. It looks like TypePropertyIterator.Get(Specifier d) has a yield break in the first line of the method implementation. All necessary changes were merged into the release branch thursday last week, so next build should have it. fiyorin, GameDevCouple_I, pshtif and 4 others like this. Reinstall the unity addin for vs. I tried all of the above multiple times with new projects and I can't get it to work. The Package Manager also doesn't show up for me. I also get this message in the console as soon as I open the project: "
Assembly has reference to non-existent assembly 'Unity.Transforms' (Packages/com.unity.entities/Unity.Entities.Properties/Unity.Entities.Properties.asmdef)"
The Scripting Runtime is set correctly, I have the correct build and the manifest looks correct as well. I think I got it working earlier once but then I shut down Unity and it broke again... Oh well, I guess I'll wait until more people tested this. It seems like my packages got corrupted somehow and then stuck around in the Unity cache which is independent of specific projects. After I deleted them and reloaded the project, everything works fine. Deleting the "staging-packages.unity.com" forced Unity to download the packages again, fixing the problem. Version b12 both, regular and this one, does not update my project correctly. Says it can't find unity engine. B13 works and the one before b12 works. This is kind of a lot of aawonky setup to get this to work. I hope it's just included in the next beta release. I want beta 14 SOO bad I cant see straight. I understand waiting is important but Im starting to get ansy.